(b) The three dimensional tokens were transformed into two-dimensional pictographic signs, and like the former tokens, the pictographic script served exclusively for accounting (3500–3000 BC); Impressed tablet featuring an account of grain, and Pictographic tablet featuring an account of 33 measures of oil, from Godin Tepe, Iran [Fig 1 & 2] are attached. 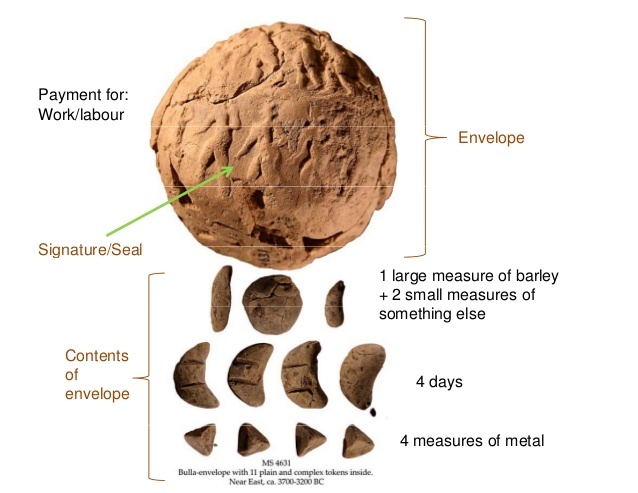 verified at all times, while the clay is still wet, the tokens themselves were sealed inside, and the whole package was left to dry or be fired. The copy of the tokens on the envelope is itself an important conceptual leap, a first step toward representing tokens abstractly as two-dimensional cuneiform signs, not three-dimensional tokens.Thus ,these markings were the first signs of writing. Finally,when the ancient Mesopotamians have realized that, If the tokens inside are represented on the envelope and the tablet is fired making it impossible to alter it in any way, the tokens themselves inside the envelope aren't necessary. 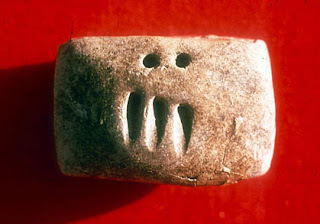 Therefore, About 3200 BC, once the system of impressed signs was understood, clay tablets—solid cushion -shaped clay artifacts bearing the impressions of tokens— replaced the envelopes filled with tokens. 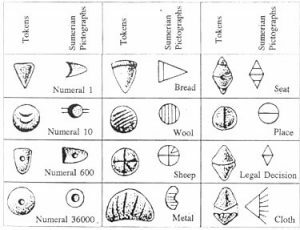 With this, it makes sense that cuneiform signs derived from the shapes and markings on tokens, which do, indeed, constitute a "picture" of sorts but not the sort of picture expected in the standard view of a pictograph. It's a picture of a token, not a picture of the thing itself. These types of symbols, which derived from tokens, were picture signs or "pictographs." They were not, however, pictographs of the kind anticipated by many others. The signs were not pictures of the items they represented but, rather, pictures of the tokens used as counters in the previous accounting system. This was a decisive step in the invention of writing and amounted to a revolution in communication technology. 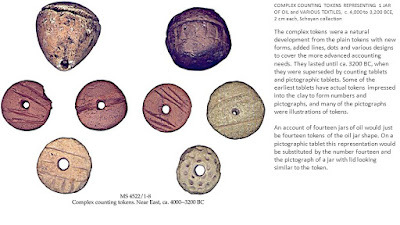 The impression of a cone and a sphere token, representing measures of grain, resulted respectively in a wedge and a circular marking which bore the same meaning as the tokens they signified .They were ideograms—signs representing one concept. The impressed tablets continued to be used exclusively to record quantities of goods received or disbursed. They still expressed plurality in one-to-one correspondence. The next step was to stop impressing the tokens on the envelope and instead draw their picture on the envelope's wet clay, Thus ,Pictographs—signs representing tokens traced with a stylus rather than impressed—appeared about 3100 BC. These pictographs referring to goods mark an important step in the evolution of writing because they were never repeated in one-to-one correspondence to express numerosity. Besides them, numerals—signs representing plurality—indicated the quantity of units recorded. For example, ‘33 jars of oil’ were shown by the incised pictographic sign ‘jar of oil’, preceded by three impressed circles and three wedges, the numerals standing respectively for ‘10’ and ‘1’ The symbols for numerals were not new. They were the impressions of cones and spheres formerly representing measures of grain, which then had acquired a second, abstract, numerical meaning. The invention of numerals meant a considerable economy of signs since 33 jars of oil could be written with 7 rather then 33 markings.In sum, in its first phase, writing remained mostly a mere extension of the former token system. Although the tokens underwent formal transformations from three- to two-dimensional and from impressed markings to signs traced with a stylus, the symbolism remained fundamentally the same. The only major departure from the token system consisted in the creation of two distinct types of signs: incised pictographs and impressed numerals. This combination of signs initiated the semantic division between the item counted and number. It says,the ancient tamil scribers, classified the script into Vadivezhuthu, Peyarezhuthu, Mudivezhthu, thanmaiezhthu which you can simply compare with the present day classification of writing as ;Pictograph, Logograph, Syllabary and Phonetic types. Also, it makes clear that Tamils until 8th century AD followed all four writing systems to convey messages on stone, pottery (both personal and burial pottery) and many more media in the past!